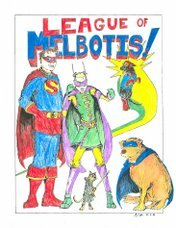 League of Melbotis: Too Many Questions. I have nothing better to do, so you can suffer. Found at Calvin's Canadian Cave of Coolness. 1. First thing you wash in the shower? Myself! 3. Would you kiss the last person you kissed again? I better. I'm married to her. 5. How are you feeling RIGHT now? Meh. Sort of proud of Scout for getting on the couch. 6. Whats the closest thing to you that’s red? A dog toy. 7. Tell me about the last dream you remember having? Steven was learning archery as part of his initiation with the Freemasons. Also, I do not ever remember my dreams five minutes after I wake. Thwas weeks ago. 8. Did you meet anybody new today? No. Unless you count the new waitress, who kept calling our usual waitress "Ninja". It was weird. 9. What are you craving right now? Waking up on my own. No cats, dogs or alarms involved. 10. Do you floss? Not as often as recommended. 11. What comes to mind when I say cabbage? A Bruce McCullough character from "Kids in the Hall" who had a cabbage for a head. 12. Are you emotional? I get hungry sometimes. Does that count? Sure. Why not. 13. Have you ever counted to 1,000? As a kid who could never fall asleep, I would break it up into sets of hundreds, but yes. 14. Do you bite into your ice cream or just lick it? I don't eat ice cream. But lick, I guess. 15. Do you like your hair? No. Never could pull off the perfect Kirk Coif. 16. Do you like yourself? I don't know how to gauge this question. I like myself more than I like, say, Michael Vick. 17. Would you go out to eat with George W. Bush?. Sure. he strikes me as a man who knows a good bBQ joint. 18.What are you listening to right now? My black lab snoring. And the Beverly Hillbillies Theme that plays in my head on a perpetual loop. 19. Are your parents strict? I'm 34. So not as much anymore. Mother often lets me choose my own pants now on weekdays. 20. Would you go sky diving? My mass at the standard acceleration for gravity is a mighty force, indeed. I do not wish to test the durability of any parachutes. 21. Do you like cottage cheese? Yes. But not this awful "diet" Cottage Cheese I bought at HEB. Salt is not a substitute for delicious. 23. Do you rent movies often? No. OnDemand, movie channels, cable and some NetFlix at home, and we go to the theater regularly. 24. Is there anything sparkly in the room you’re in? It's a fairly low-sheen sort of room. 25. How many countries have you visited? Four? Five? Not many. 26. Have you made a prank phone call? Not in the 21st Century. But we used to make up surveys and call people after my voice changed in middle school. Good times. 27. Ever been on a train? No. 28. Brown or white eggs? I'm no egg racist. Either is great. 29. Do you have a cellphone? Blackberry. 30. Do you use chap stick? No. It's habit forming. I have enough ridiculous habits. 32. Can you use chop sticks? On a 2nd grade level. But could not until JAL demo'd in Winter of 1993-94. 33. Who are you going to be with tonight? Dinner with Jason and Jamie. Visit Cassidy. Wind up with Lucy and Scout. 34. Are you too forgiving? I'm still talking to you, aren't I? 35. Ever been in love? Married 9.5 years. 36. What is your best friend(s) doing tomorrow? Whatever she wants. I will probably drive. 37. Ever have cream puffs? I have to believe I have. 38. Last time you cried? Like a good jag? Not just a little weepy at "Up"? Off and on for a few weeks after we lost Melbotis. 39. What was the last question you were asked? What time should I wake you up to walk the dogs? Answer: Do not. Let a brother sleep in once in a while. 40. Favorite time of the year? Halloween - Thanksgiving. 41. Do you have any tattoos? Not on the outside of my skin. 42. Are you sarcastic? Great question. 43. Have you ever seen The Butterfly Effect? In action? Yes. 44. Ever walked into a wall? Define "wall". 45. Favorite color? A certain spectrum of blue. 46. Have you ever slapped someone? Sort of. It ended poorly. 47. Is your hair curly? Define "curly". 48. What was the last CD you bought? CD bought? Hurm. I have no idea. It's all iTunes and gift certificates in recent memory. 49. Do looks matter? This question is bull@#$%. I don't care how charming you are. If you have a squid head, I'm not into you. 50. Could you ever forgive a cheater? Cheating on me? Unlikely. Cheating on others? Hilarious. 51. Is your phone bill sky high? Who has a high phone bill? 52. Do you like your life right now? It's pretty @#$%ing charmed, all things considered. 53. Do you sleep with the TV on? No. 54. Can you handle the truth? I usually have to. 55. Do you have good vision? Awful. 56. Do you hate or dislike more than 3 people? Nobody I know. Just people on TV. 57. How often do you talk on the phone? At work, often. At home, rarely. 58. The last person you held hands with? Imaginary Superman is a person, right? 59. What are you wearing? Surprisingly: jeans, maroon t-shirt, socks, watch, boxer-briefs. 60.What is your favorite animal? The turkey. For it is delicious. And I guess I'm a "dog person"
61. Where was your default picture taken at? What? 62. Can you hula hoop? No, and its been requested I never try again in public. 63. Do you have a job? One for which they pay me, and many which I do for free. 64. What was the most recent thing you bought? Coffee. 65. Have you ever crawled through a window? Yes. 66. When was the last time you’ve been to church? Its been a while. If I say how long, my mother will cry and we'll all end up in church when she's in town. 67. What’s your least favorite meal? Nosebleed Soup, Roasted Orphan, with a side of broken bottles. 68. Did you ever steal anything by mistake? An entire shelf from Ikea. Don't worry, they'd already made their money off of us. 69. Have you ever won anything? A Dirt Devil at Project Prom. Which I would not remember if the girl who got her raffle ticket in line in front of me hadn't won a cruise for 4.